It arrived quickly, was packaged well, and easy to assemble. Looked beautiful once assembled. Lend a little something posh to your decor with this sleek and chic settee. The minimalist design makes this modern settee loveseat ideal for smaller spaces, and it comes in a variety of colors to match your furnishings. A tufted backing and plush cushions make this loveseat a comfortable spot to relax. The perfect settee to add to any bedside. The size is just right for this purpose. Although if you want to use it as a sofa then I would say it is too small. It's a great furniture accent piece. Color goes with any other color you want to use. I thought the price was very reasonable when comparing to other items and stores. I ordered this chair in the dark blue, with the intention of using it as a dining bench. It's definitely a *nice* bench, and I plan to keep using it, but it's honestly not very suitable for a dining bench. The fabric is textured, so it tends to pick up crumbs, and it stands about 2 inches too short to be a dining bench. With that said, I replaced the legs with ones 2 inches taller, and it does work better that way. This is a cute little accent piece and fit perfectly in my bedroom corner. The photo was a little deceiving on the size, because it does not show true scale to size, so pay close attention to the measurements. I only gave 4 stars because I think the pricing is a little high. The settee was fairly easy to put together. It was well packaged in two main pieces (chair back and seat cushion) which are joined together by 6 large bolts and the legs easily screw into the bottom of the seat cushion, however the legs were a bit confusing due to there shape, but all in all I love the piece. All tools are included. It says have 2 adults for assembly but I was able to put it together by myself. Perfecto! I purchased the settee in gray. It is a light color and blends well with light neutrals. It came on time without shipping delays. Assembly was very easy and all tools and hardware was provided. It was a one person assembly project that took about 45 min. It is light weight and I was able to carry it myself. I am pleased with the product, it sits solidly. The price was reasonable. I use it as a settee, but plan to use it as a bench at the dinning room table. My only concern is if the legs were facing the correct way. I Love it. this is a nice looking loveseat for the price. It is, unfortunately, small, as in short. It almost looks like a child's piece of furniture. It is almost 2 inches lower than a regular chair seat and thus the back also looks low. for a small apartment with a modern, minimalist bent, it would look really great. Stylish, exactly what I expected. The legs come in a bubble wrapped bag with the hardware to install them. 2 of the legs fell out of the packaging and got scratched up, but the damage was barely noticeable, so I kept the piece. Not the sturdiest, but great size and style. Exactly what I needed for extra seating in a small space. I ordered this settee for my bedroom. I wanted a small loveseat, but the space was too small for that and I found this settee and according to the measurements it seemed like it would fit great. It took me about 30 minutes to put it together, but that's mostly because I was doing it by my self, if you have an other person to help, it's much quicker. The settee looks so good, and it is actually quite comfy! It looks expensive and I'm very happy with the color, and the size. This settee is about 2-3 inches lower than normal chair height. Good quality, just too short. If you are using it alone in a setting, it would be fine but don't group with other chairs. 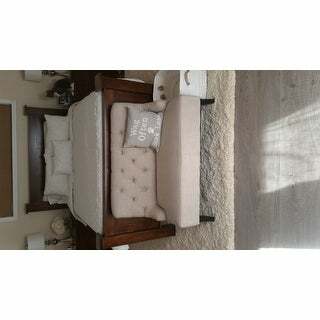 This is a lovely little loveseat---little being the operative word here! It sits low and is quite small, but fits perfectly in the spot in which it now lives in my home. with a cushion, quite comfortable, too. Tiny - awful. Do not waste your money! I was extremely disappointed with this settee. It is SO tiny - it seriously should be for children. So very short. I sold it to my neighbor for her playroom. The entire Christopher collection is short, low to the ground. We appreciate you taking the time to write a product review. we have verified the dimensions in our description accurately reflect the size of the item. Thank you for shopping with us. Very nice settee however make sure you check the dimensions properly. Much smaller than picture depicts. Very cute for small areas. 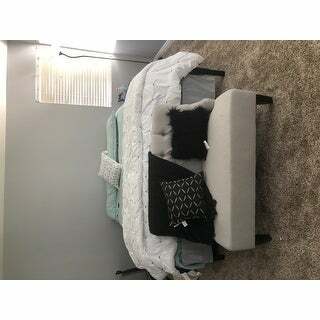 I have a California King bed, I placed this couch at the foot and it looks great. Easy to assemble, exactly as described. 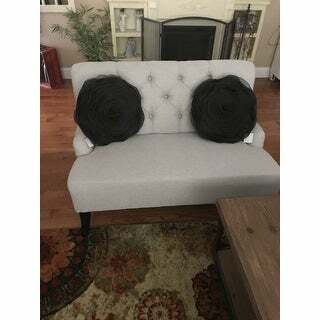 This settee is a really cute style and overall I am happy with it. The quality is pretty good, but not excellent. Color is nice and it works well for what I needed. Super cute. Very easy to put together. Looks great with some pillows. Perfect fit for a small space I needed to fill. Great price for a nice piece of furniture. I love the color. It's smaller than I thought it would be, so think it would be perfect for a childs room or small office. Comfort is average. It’s shorter then it looked. "Is the light blue, like a baby blue/powder blue or a lighter turquoise/teal blue? It looks like it's more on the lighter turquoise side." "I want to buy legs that make this tall enough for a dining bench. What is the length of the legs that come with it?" The legs are regular chair height with the cushions. My dining chairs, with cushions, are 16 inches high and the settee is 15 inches high. Guess your problem would be the height of your dining table!! The length of the legs are 8 inches---the height of the cushion makes it another 8 inches taller. "What is the bolt type/size for the legs?" The Bolts come pre-mounted in the legs, which are twist on (by hand). "I am wondering if the height of the seat itself would be high enough to use for a kitchen table?" The seat height is approximately 17 inches. Most standard dining chairs have a seat height of approximately 18 inches. We do not recommend anything more than 250 pounds. "How many boxes does this item get shipped in? I am driving to pick this up and want to make sure I bring the right car "
"what color is the feet of the chair?" Hello alm1004, we try to represent the colors of our products accurately. Unfortunately, due to the difference in monitor colors we cannot guarantee that the color will match exactly what you see on your screen. The legs on this are black in my opinion. Thank you for shopping with us.